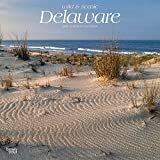 Delaware may be the second-smallest U.S. state, but it’s big in history and natural beauty. From historic Fort Delaware to bustling Rehoboth Beach to beautiful Brandywine Valley, Delaware draws visitors for its historic landmarks, unspoiled nature, charming towns, and of course, tax-free shopping! Celebrate the Diamond State will this square wall calendar.